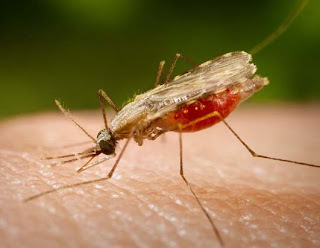 Features of malaria include high fever over 38C (100.4F) along with chills and sweating. There is intense muscle pain, headache, blurring of vision and dizziness. Some patients may develop diarrhea and vomiting as well. Symptoms develop within seven days after being bitten or may take between 10 to 15 days to appear. Hyperthermia related to the development of malaria parasites in red blood cells. 1. · Assess any complaints or signs of increased body temperature changes. R /: Increased body temperature will exhibit a variety of symptoms such as red eyes and the body feels warm. 2. Observation of vital signs, especially body temperature as indicated. R /: To determine interventions. R /: stimulates the hypothalamus to the center of the temperature setting. 1. Supervise the input and output of fluids. Estimate loss of fluid through sweat. R /: Provides information about the fluid balance, are guidelines for fluid replacement. 2. Observations of decreased skin turgor. R /: Indicates excessive fluid loss / dehydration. 3. Give parenteral fluids if needed. R /: Helping peroral fluid intake. 1. Encourage bed rest / or activity restrictions. R /: Maintaining sufficient energy savings. R /: a clean mouth can enhance the flavor of food. 3. Provide food in a well ventilated, pleasant environment, the situation is not in a hurry, accompany. R /: Pleasant surroundings lower stress and more conducive to eating. 4. Collaboration of antiemetic drugs. R /: Eliminate the symptoms of nausea and vomiting. 1. Determine the patient's perception of the disease process. R /: Creating a knowledge base and provide awareness of individual learning needs. 2. Review the disease process, the cause / effect relationship factors that cause symptoms and identify ways to lose factors. Encourage questions. R /: Trigger factors / ballast individuals, so the patient needs to be aware of lifestyle factors may trigger symptoms. Accurate knowledge base gives patients the opportunity to make an informed decision / choice about the future and control of chronic diseases. Although many patients know about the disease itself, they can experience that has been left behind or wrong concept. 3. The review: medicine, destination, frequency, dosage, and possible side effects. R /: Improving understanding and to increase cooperation in the program.